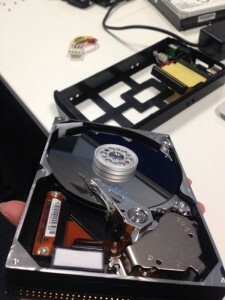 I nearly lost 10 years worth of data (& I work for a company that sells backup solutions!) NEVER under estimate the importance of having a backup!!!! … and I don’t just mean 1-copy, I had a backup of my data on an external hard-drive but I somehow managed to drop this at the same time as my 7 year old MacBook decided to give up the goose! Could just be bad luck but it certainly made me realise how important it is to BACKUP your personal data! I was gutted when I realised I nearly lost 10 years worth of photo’s, personal videos and files! Can you imagine if you lost all of your’s? You don’t realise the importance of your data until this happens! Power went on (nearly setting fire to the office first time…!) and it sounded horrific… scratching and squealing, I still can’t quite believe that I managed to get the majority of my data off of this thing!!! Not everyone has a copy, or 3 copies… or even someone they know who can help them rescue their data!! So YOU MUST consider how you will feel if this happens to you. I was LUCKY, but will you be???!! How much is your personal data worth to you?? ?